No one will ever know how many lost their lives in Galveston in the Great Storm of 1900. The best estimate is that at least six thousand perished. It was the most awesome natural disaster in our history as a nation. A major center of commerce, with a population of 40,000 at the turn of the century, Galveston was the most important seaport in Texas and poised for greatness in the new century. Then, on September 8, 1900, came a hurricane of such fury it drove an angry ocean before it, covering the island from Gulf to Bay and laying waste to the city by the sea. We left Richmond on Monday afternoon of Memorial Day, taking Hwy 6 to Galveston.[Map]. It took us less than 2 hours to make Galveston Island. We stayed at the Bayou Shores RV Park that is just off 61st Street. They are located on the shores of Offatts Bayou and our site (C13) was about 30 feet from the waters edge. We had a good view of the boats sailing on the bayou. Since the holiday was ending as we arrived, and all the working folk were returning to their jobs, we had plenty of room to ourselves in the Park. This was our site at Bayou Shores, looking north toward Offatts Bayou. 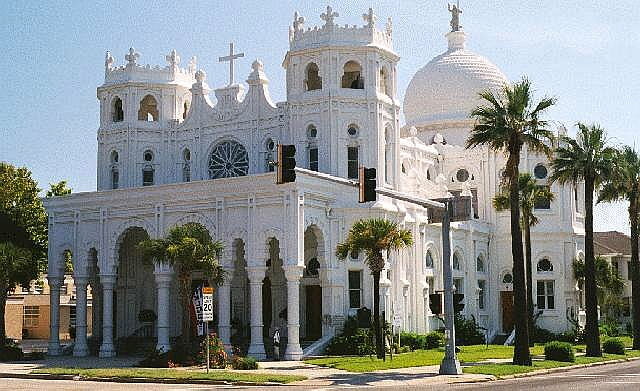 Galveston is our favorite "close" place to visit. There was hardly any traffic during the week (Forget the weekends!!). The places to see are all located pretty close to each other and you can walk between many of the sites. 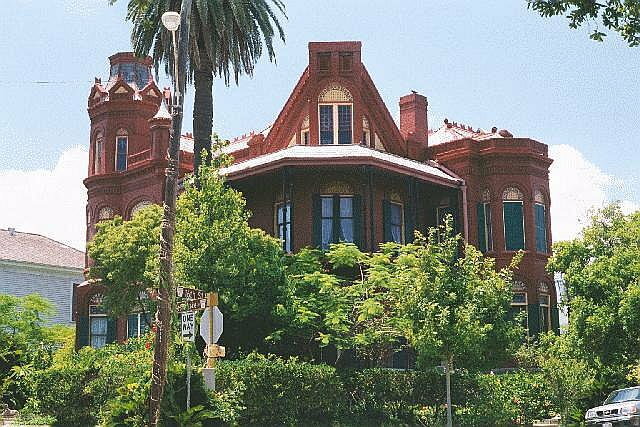 Galveston is rich in pre-1900 history and so many old buildings and homes remain in spite of the famous 1900 Hurricane. You could easily spend two weeks here and not run out of interesting places to visit and things to do. It offers a lot more than just the beach. 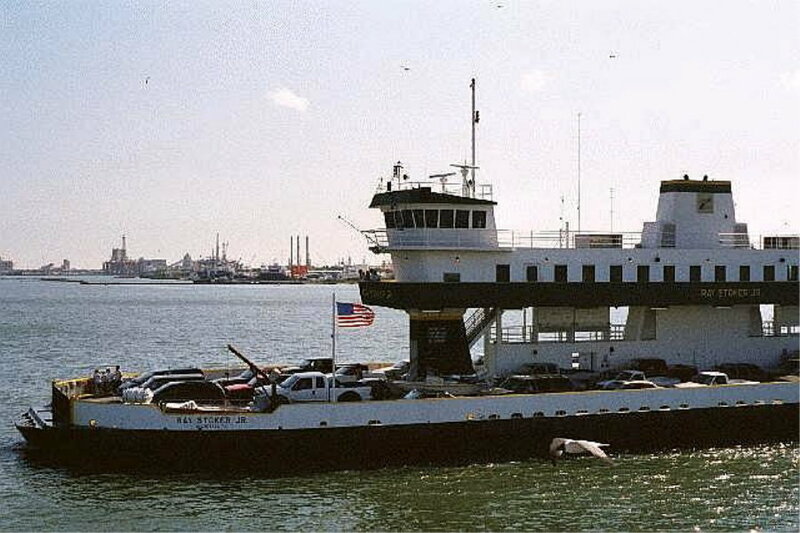 We took the Bolivar Ferry across to Bolivar Island. 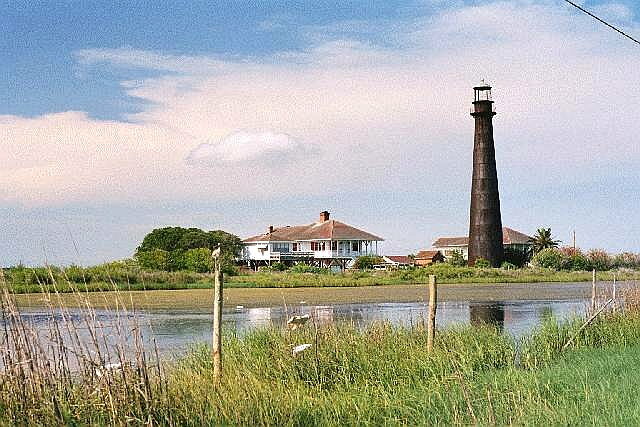 Located on Bolivar Island just northeast of the ferry landing is an abandoned lighthouse. 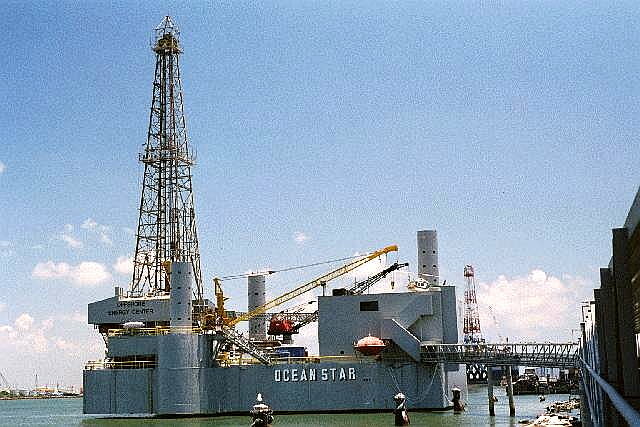 We toured the Ocean Star Offshore Drilling Rig & Museum at 20th Street and Harborside Dr. It is a completely refurbished jackup platform and has a museum with many exhibits. 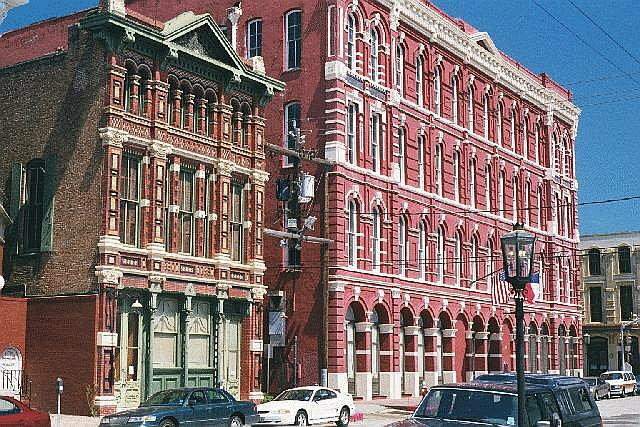 A Sampling of Galveston historic buildings. 1402 Broadway, Walter Gresham Home - "Bishop's Place", 1887-93. 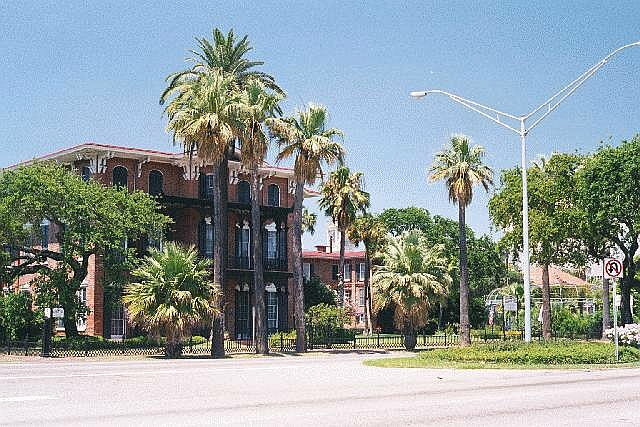 Walter Gresham was an able lawyer who came to Galveston in 1866. 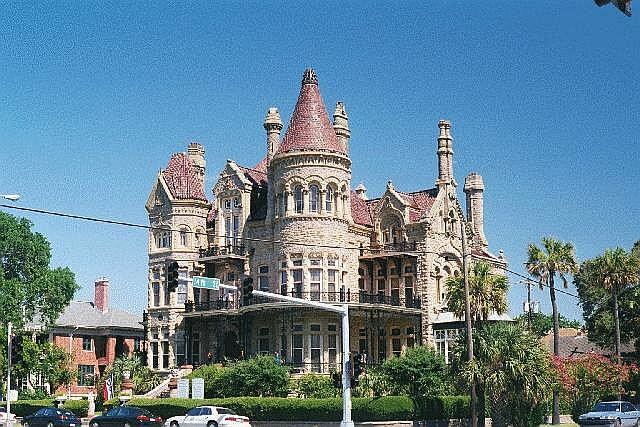 The building is a French medieval style and abounds with towers and turrets. Delicate cast iron work decorates the porches. 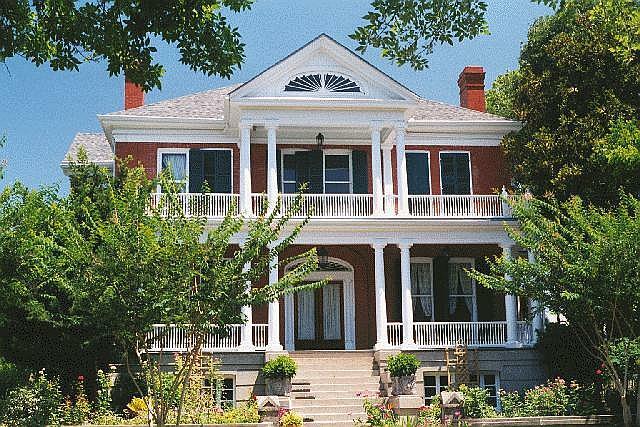 Constructed of pink and blue Texas granite, white limestone, and red sandstone, the home is operated as a house museum. Broadway & 14th, Sacred Heart Catholic Church, 1903. Built after the 1900 Storm, this church is a combination of Gothic and Moorish elements in a typical Latin cross plan with two polygonal towers. In 1915 the dome was added. In 1950 a copy of the Christ of the Andes statue was placed atop the dome. 1428 Ball, M.W. Shaw House, c.1900. Home of Texas' oldest jeweler, this is one of the few brick homes built during this period and features eight fireplaces. 1502 Ball, Lockhart House, 1890. Built for Judge W.B. 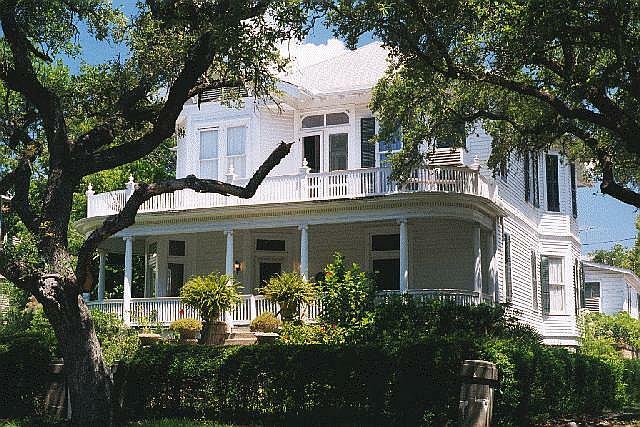 Lockhart who married Ester Gresham, the oldest daughter of Col. and Mrs. Walter Gresham, who built "Bishop's Place". After 1900, the one story cottage (upper story) was raised and the present first floor added. 1602 Post Office, Landes-McDonnough House, 1886. This Richardson Romanesque brick residence was built for H.A. Landes, wholesale grocer, cotton factor, ship owner and importer. In 1909, John McDonough, owner of McDonough Iron Works, purchased it. 1617 Church Street. 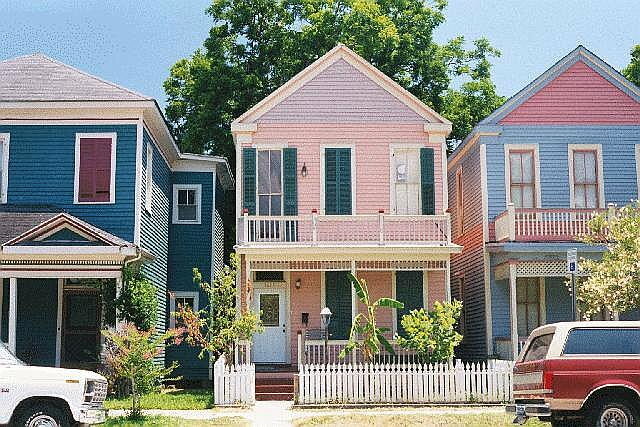 We don't know anything about these homes, but of interest is how close together they are (land must have been expensive) and how colorful they are. 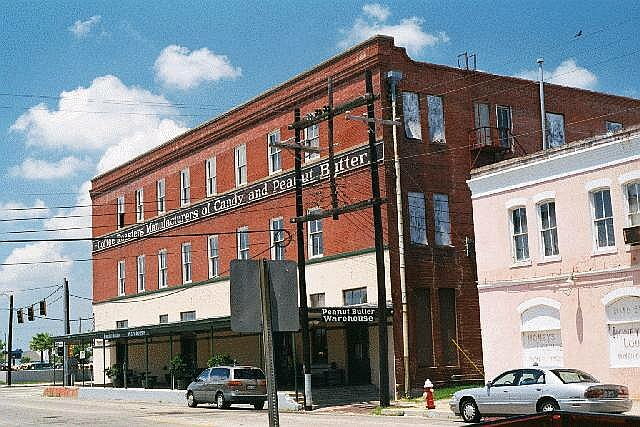 2100 Mechanic, Galveston News Building located in the Strand area. 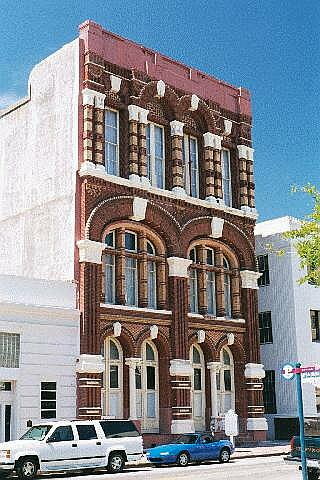 Kempner & Mechanic, Kauffman & Runge Stewart Building (right) located in the Strand area. 1627 Sealy, John C. Trube House, 1890. Described as "the strangest house in a city of strange houses", it was designed by Alfred Muller. It is a combination Gothic and Moorish design. Rusticated Belgian cement stuccoes the brick walls. The mansard roof with nine gables is covered with gray slate. 2328 Broadway, Ashton Villa, 1859. 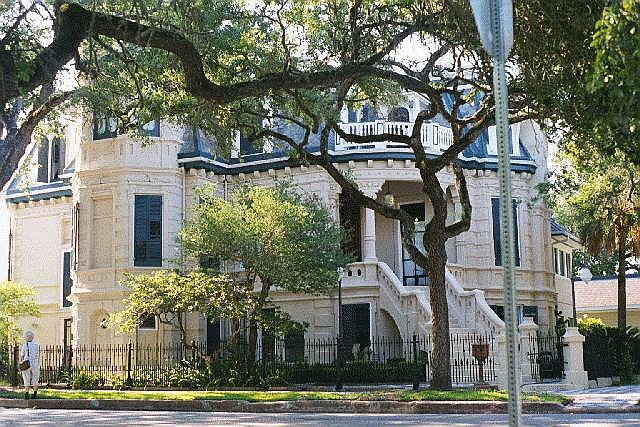 The home was built by James Moreau Brown, one of Texas' wealthiest businessmen. The Peanut Butter Warehouse is located in the Strand area and houses an antiques dealer. 1402 Ball. 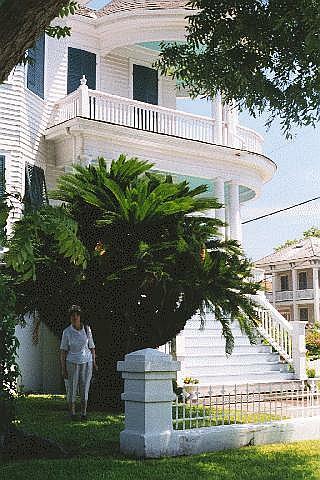 This house had what appeared to be the largest Sago Palm Tree we had ever seen! Well, this ends our Galveston, TX RV trip. We hope you enjoyed our web page. God willing, we plan to take another short TX trip soon. © CookFamilyHome.com. All rights reserved.